Laparoscopy refers to a type of surgery in which operations in the abdomen are performed through small incisions, usually about 0.5-1.5 cm across. Other names or this type of surgery include minimally invasive surgery (MIS) and keyhole surgery. A thin viewing tube (laparoscope) is placed through the small incisions made in the abdomen and a fiber optic system provides light for the surgeon to see. 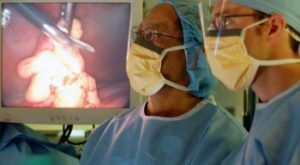 The video camera on the laparoscope transmits the images to monitors in the operating room which are used to see inside the abdominal area. The abdomen is usually inflated with carbon dioxide gas to create a viewing and working space. The laparoscopy procedure can be used as a diagnostic procedure, for ovarian cancer treatment, or to prevent ovarian cancer. When a transvaginal sonogram shows a complex mass in the pelvis or ovaries, a laparoscopy is usually performed to determine if the mass is benign or malignant. There is some controversy regarding the use of this procedure. Surgeons and doctors are concerned that the laparoscopic procedure can lead to a failure to diagnose ovarian cancer if it is present. This is because the surgery only allows surgeons to look at the outside of the ovary, so it is only possible to tell if a mass is cancerous if it has spread outside the capsule of the ovary. If it is still inside the ovary, it can look like an ovarian cyst. If a large incision is made instead, such as through a laparotomy surgery, it is much easier to look at the ovary internally. Another concern is that it can be easier to spread tumor cells with this type of surgery. Having said all this, the likelihood of an ovarian or abdominal mass being malignant is much less likely than it being benign. One study found that 87% of patients who underwent laparoscopy surgery for a pelvic mass had a benign diagnosis, while 13% were malignant. So the decision to undergo a laparoscopic surgery or laparotomy may depend on the case, if a woman is at low risk of having cancer based on the sonogram tests, a laparoscopy may be a better option. However, if the sonogram results are more worrisome, a laparotomy may have to be considered. 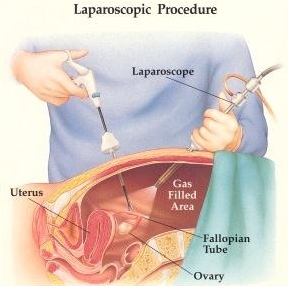 As a treatment for ovarian cancer, laparoscopic surgery can be used in both early and late stage disease. For early-stage cancer, the surgery is used to stage tumors by determining the organs involved. Staging involves sampling various tissues for biopsy to determine the extent of the disease and what type of ovarian tumor it is. In most cases surgeons will not operate laparoscopically to treat early-stage ovarian cancer. When it is diagnosed inadvertently during laparoscopic surgery for a suspected benign mass, the surgeon can either continue the surgery laparoscopically, or convert to a laparotomy. In most studies the outcome of patients was not seen to be adversely affected by the procedure being performed laparoscopically. However as number of important questions regarding the safety and efficacy of minimally invasive surgery in early-stage ovarian cancer. Trials with more patients and longer follow-ups are needed to answer these questions definitively. For late-stage ovarian cancer, laparoscopic surgery can be used to determine the feasibility of treating the tumor with surgery. In some cases the tumor will be too widely spread to remove with surgery, so this type of surgery is useful to see the extent of the tumor and decide whether or not to perform a laparotomy to remove it. In addition, it is also being studied as a method of debulking to remove as much as the tumor as possible for patients with advanced ovarian cancer. Minimally invasive surgery can also be used to perform a second-look evaluation following chemotherapy. Second-look surgery is performed to assess how well the chemotherapy worked by seeing if there are any remaining tumor cells visible. Laparoscopy can also be used to perform a prophylactic oophorectomy in women who are at high-risk of developing ovarian cancer. These include women with hereditary mutations in BRCA1or BRCA2. Some of the risks include injuries to blood vessels or the small or large bowel. Another potential complication involves the use of carbon dioxide, which is not completely removed during the surgery. The gas tends to rise and can push against the diaphragm and can exert pressure on the phrenic nerve. This produces pain, however it is only transient as the body absorbs the carbon dioxide and eliminates it through respiration.